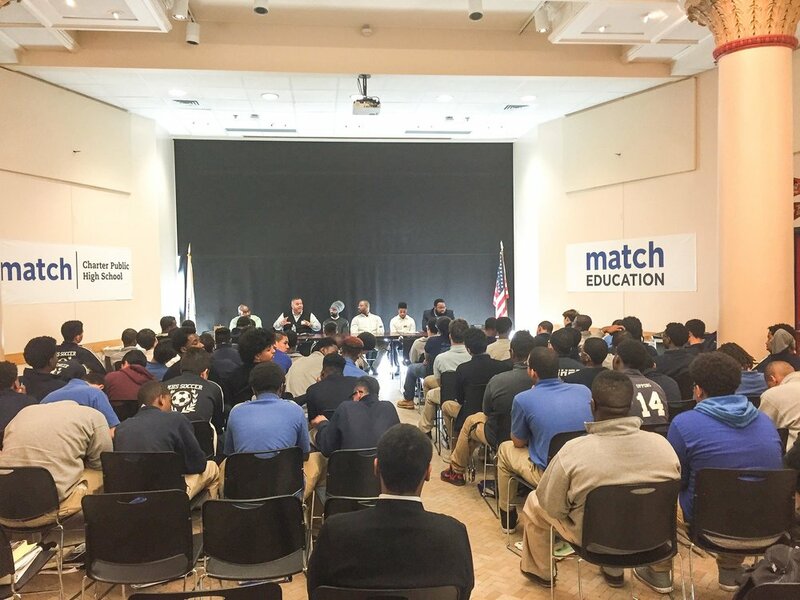 Faculty at Match High School, led by 9th grade English teacher Ashley Davis and dean of students Robert Hendricks, organized a career panel discussion for all students as part of the school’s celebration of Black History Month. Students were invited to ask questions and learn from men and women of color working in a variety of professions. 1. Code-switching happens when a person has to purposefully change his/her speech, behavior, etc. depending on the setting he/she is in. Describe a time when you've had to code-switch in the workplace. 2. Describe the racial makeup of the people at your place of work. Would you say its diverse enough? Why or why not? If not, how does it influence your day-to-day experience as a person of color? The boys heard from six men of color, while the girls heard from seven women. They talked through a wide range of issues -- from the simple (“what did you major in at college?”) to the not-so-simple (“how does our culture (as Black or Latino) affect our identity in the workplace?”). Thank you to our panel participants for being so generous with their time and experiences: Andrea, parent advocate and entrepreneur; Jasmine Carr, student, Harvard Law School; Michele Carroll, director of employment, Match Beyond; Stesha Emmanuel*, attorney, Todd & Weld, LLP; Craig Engerman, CEO, Arimann Building Services; Elyshia Hairston*, associate, Iron Mountain; Daniel Joiner, student, Harvard Law School; Kelsey, student, Harvard Law School; Terrence Lomax, entrepreneur, Thinkforward Media; Patrick McDowell, financial analyst, Arrowstreet Capital LP; Jessica Popper, nail technician; Travis Roache*, technology operator, IBM; Kevin T. Taylor, educational C.O.O., KIPP Schools MA.